Today, Let’s talk about how you can post to multiple Facebook groups (Joined Groups of course!) to get your marketing game to the next level. We are going to talk about a Facebook Auto Poster and how it can impact your business. Many businesses don’t fully utilize the power of Facebook and it’s costing a lot. In this post, you’ll learn how to use Facebook auto posting and give the much-needed boost to your business. Online marketing is getting harder day by day because everyone is doing some way of marketing online. Some use social media marketing, some use search engine optimization, and what not. Social media marketing doesn’t require as much work as SEO, But reaching a substantial number of people on Social media is not as easy. For example, What do you usually do for social media marketing? Post to your Facebook profile and your business page, post to your twitter profile and that’s it. But that doesn’t get you as much exposure and continuous business or traffic to your website. Thank god for Facebook groups! Posting to Facebook groups on daily basis can get you access to a wide range of audience looking specifically for your service. But going to each group one by one and posting your website link etc. will take you days to post on just 100 groups! But MaherPost Facebook Group Poster can automate this for you and you can post to all groups you are a member of at once. What is Facebook Auto Poster? Facebook Auto Poster is a tool that helps you automate your Facebook activities completely and get your business exposure without doing hard work. There are a lot of tools out there for Facebook Marketing, But none like MaherPost Facebook Auto Poster. In today’s world, working smartly is the way to go. MaherPost can help you auto post to joined Facebook groups, your business pages, your liked pages, and your Facebook profiles. Why Facebook Marketing is Important? Whatever business you have, If you are not using Facebook to market your business, you are missing out. Facebook still has the largest user base and most active users online any month. So you can reach a substantial number of people on Facebook and advertise your business. Not only that, there are many different ways you can advertise your product on Facebook, Like Business Pages, Groups and User Profiles. Whether you run an online business or offline business, you can get good results from Facebook, if you use it correctly for your business. Did you know that Facebook groups are more important than pages now? A few months ago, Facebook rolled out an update which gives Groups more importance than Pages in the newsfeed. So by posting to relevant Facebook groups can give you much more exposure now. Even more than the business pages! Just think about how many members any Facebook account has, it can create a lot of buzz for your products or services on Facebook if you post to the groups regularly. Schedule your posts by selecting scheduling time, delay, etc. Once you have signed up for MaherPost, you will receive your login details on your email address. This is where you can schedule your posts from. 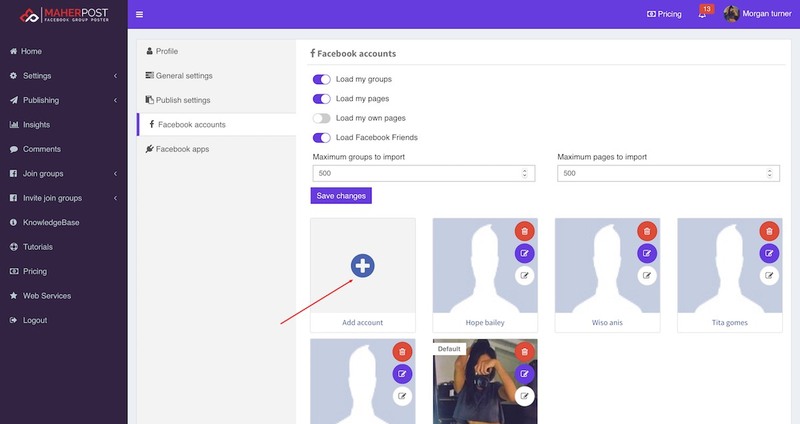 But before you can schedule a post to your joined Facebook groups, you need to connect your Facebook account with the app to load your account and your groups. From there, you can easily connect your Facebook account with the app. You can also select how many groups you want to import before connecting. Once your app is connected, You can go back to the main dashboard and start posting. With MaherPost, you can post text, images, links, and videos. The first thing you should do is type your message or add your link or image you want to post. Once you have done that, Click save post button to save that post into the database so you can load it easily next time as well. You can even share your business page posts to groups through MaherPost, to do that, copy your page post link and add it in MaherPost link field. With MaherPost, you can post to all your joined groups, your own Facebook pages & your liked pages as well. You can select your respective options when connecting your Facebook account to choose which options to load. If you just want to post to groups, you can just select Load my groups. Now when posting, you can either select groups one by one or select them all at once. You can also create categories of groups for the easy selection of groups you want to post to. So when you want to schedule a post to Facebook groups or pages, select them by scrolling down to groups area. Once you have selected the groups you want to post to, Let’s move on to the next step. For posting to groups, there are two ways on MaherPost. One is Post now, Which allows you to post to your select groups live from your browser while your window is open. Post now has only one option, Which is Post interval (Seconds). Select time delay you want between each post and click Send now. It’ll start posting to your selected groups one by one live from your browser and show you live status. Generally, we don’t recommend Post now for most users. Another option is the Schedule option. In schedule option, you can select your schedule date & time and other settings and the app will post to your selected groups at your set time on autopilot, you don’t have to keep your computer open for that. For most people, You just have to select time delay between each post and select schedule time and that should take care of it. After selecting those settings, you can click Save the schedule and the app will post to your selected groups at the selected time depending on the time delay selected. And that’s how you can use MaherPost to schedule your posts to multiple Facebook groups automatically. In 2011, We found that many people were establishing their businesses online and especially Offline Small businesses and bloggers were using Facebook Groups to market their service to their target audience. But it was too much work posting to each group one by one and it took hours to do it and no one had a strategy to do the Facebook group marketing the right way. 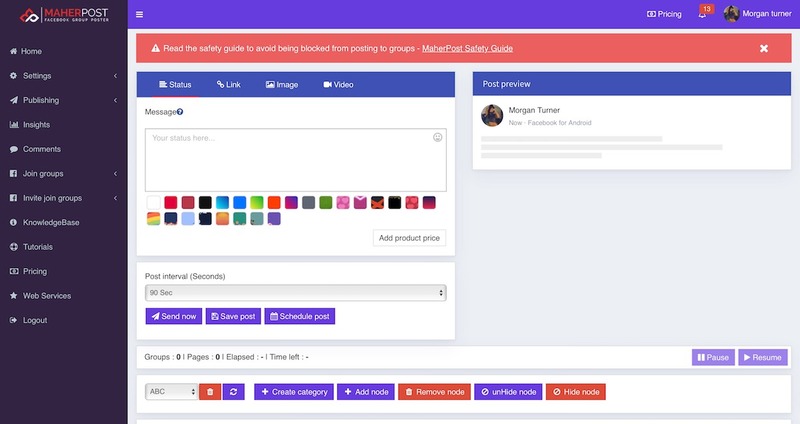 So we created a Facebook group poster app and started offering it free to MaherHackers users. Many people started using it and because it was free, many people also abused the app a lot. So after a few months, We created MaherPost. 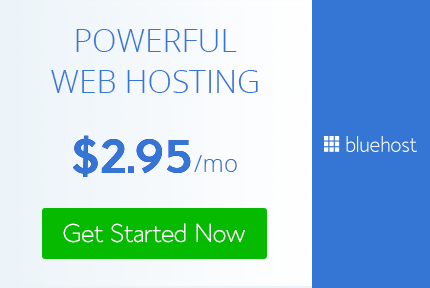 We made it a paid tool to allow only serious businesses and bloggers to access it. Over the years, we made many changes to the app. We always try to add new and innovative features to make the app best Facebook auto posting tool. Today, The app is used by many people that include offline and online small businesses, bloggers, marketing agencies and a wide range of people. Now that we have discussed the history of MaherPost, let’s look at some of the features provided by MaherPost Group Poster. Completely automated: Set it and forget it. MaherPost is a complete automated solution for Facebook Marketing. You connect your Facebook account with the app and it’ll load all your groups and pages. Why should you use MaherPost? Now you know how to auto post to Facebook groups using MaherPost, but why should you use MaherPost over traditional posting? I don’t really have to answer that question for most of you because anyone who posted to Facebook groups one by one should already know the pitfalls that come with it. The main issue is about Time. Why would you waste hours on a simple thing that you can do more efficiently by spending just a few bucks? Besides that, You cannot post to many groups as there is no proper time delay between each posting. You have to do the menial work of going to group by group, posting and doing the same thing every day. With no proper time delay and pause management, you will most likely be blocked with just a few postings. MaherPost take cares of everything for you better than you can ever imagine. You can schedule your posts in advance and see them post one by one to groups every day while you can work on important things. If you need more details and step by step guide, Visit Post to multiple Facebook groups at once guide. Is it Safe to Auto Post on Facebook? If you are posting manually, then no. It’s not safe because you will be posting to groups without any proper delays and your account will get blocked instantly. But if you use MaherPost, then you are safe. I’ll explain why. 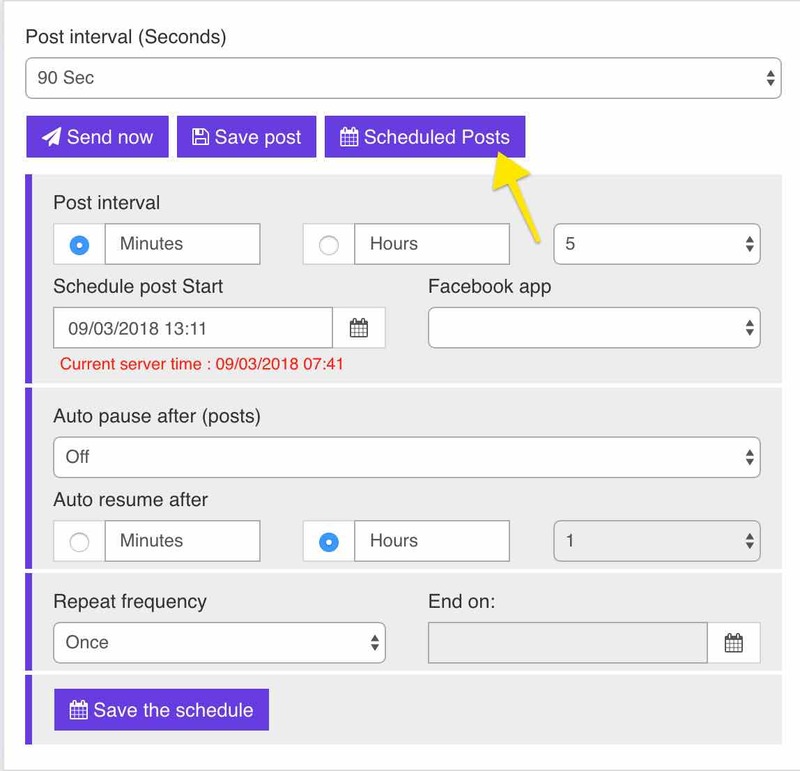 When you post using MaherPost, you can set different time delays between each group posts, you can also set a limit on how many posts you want to post every hour or day. Besides that, there are some other safety features like Unique Post, Unique Link, and Spintax. The problem with manual posting is that you just copy one message and keep posting it to different groups, but if you post the same message to multiple Facebook groups, Facebook will block your account from posting further. But with Unique Post, Unique Link, and Spintax you can have the app post different message for you on every post automatically. 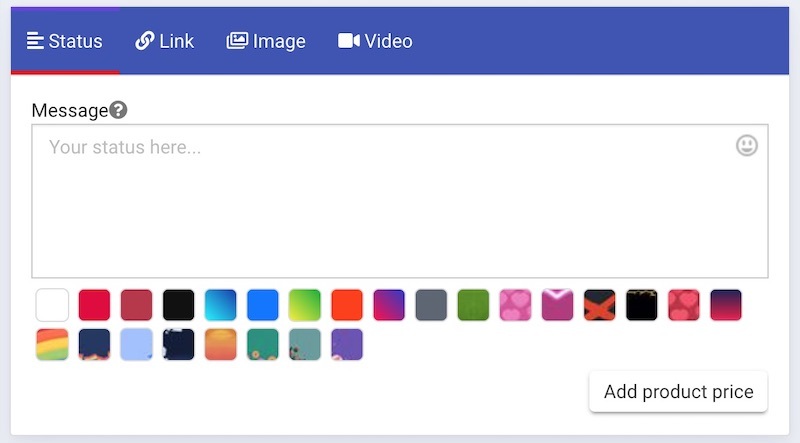 Unique Post option adds a random word to each Facebook group postings and Unique Link also adds random text at the end of your links, if you are posting links. So your posts are not all the same. Besides these two, MaherPost also supports Spintax. With Spintax, you can set MaherPost to spin text and post unique messages to groups as chosen by you. MaherPost is the best Facebook auto poster which provides so many features in a user-friendly interface. If you want to increase your business exposure and sales or increase visitors to your website, MaherPost can get it done for you. You can just set it up once and forget it. It’ll market your business on autopilot and get you new visitors and customers that you wouldn’t have got otherwise. So that concludes our comprehensive guide about how to post to multiple Facebook groups. If you think MaherPost could be a useful tool for your business, give it a try, you won’t regret it. I do not understand if I can shut down my computer for the post to be sent or if I can just close the application (but leave the computer lit)? You can shut down your computer after scheduling a post. MaherPost is completely automated. It works on auto pilot. Your posts will send out on time you selected. Do you plan on adding any scheduling functionality to the script in the future? That would be great. I post items for sale on local junk groups on Facebook. Everytime you get a comment, your posted item goes back to the top. A few times a day I comment the word bump on my own post to move them to the top. If I use this script, will I be able to “bump” my original posts to the top by commenting on them simultaneously? Yes, We have auto comment feature which you can configure to auto comment on your posts to bump them on the groups. That way, you don’t have to post to same groups again and your old post will be visible to everyone. Can i post in all my groups at the same time? Yes. But we also have the feature to add time interval between each post, so use that. So your posts won’t be seen as spam. I have this very important question about “interval of posting” to avoid facebook ban. If I want to post to one thousand groups all at once and to repeat it many times daily. What should the time interval be to avoid facebook ban? What time interval is best between each repeated post to all groups to avoid facebook ban? Please respond to this important question. Time interval varies depending on how many groups you want to post to, what you are posting etc. So you have to experiment, But interval of 10-15 minutes is what we recommend. How do you use this tool to post a picture? You can post an image or multiple images with MaherPost easily from the dashboard. thanks bro, for your hard working… I just want to say that how to upload image on multiple post page ??? reply me as soon as possible! Nice app – will try it soon. Will there be any updates to this script….auto like or share? Or any updates? i love this site a lot of resources to promote your online business!!! How much do you charge so I can have my site at the bottom instead of maherhachers? It works for me but some of the groups I checked don’t post. Can you assist me with this? Also wondering if there is anyway to make the image larger? LOG UOT & LOG IN WITH OTHER ACCOUNT IS A PROBLEM…PLZ HELP..GR8 WORK TOUGH!!! Bro thr is no option for pages…any solution ? Hey, The script shows all pages that you liked on facebook… Try to give permissions again! Yeah, It’s 100% Safe. I Used It For 4-5 Months. Good. Do you post on a bunch of groups at the same time and they don’t ban you? I did it with hootsuite and I posted on about 150 at one time then they blocked my account for a few days. I Post On More Than 2000 Groups And 5000 Profiles At A Time And My Account Is Never Blocked. Hi, do you know if there is a limit on the pages we can post on. I don’t want to get banned from my account for spamming. Or does your app get past that? Thanks! I am using it for last 2 months with up to 5 Facebook account and Facebook won’t ban you for using it. I really like the ability to post to multiple pages and groups. Is there a way that I can have my business name listed at the bottom instead of maher hackers..
Next Post: Blogger Vs WordPress: Which is the Future of Blogging?